Read each…Ahh, the politics of spin, or is it the spin of politics of spin. November saw a healthy jump in home sales. The good news is that home sales and housing starts are usually very good leading indicators about the health of the economy. Yet the bad news, in this case we have a potentially baked number. The market is being artificially inflated with both lower interest rates and a government subsidy for first time home buyers. What makes this worse is we have created a situation where we know less – we know a number improved, but we have no understanding if the economy is better. This is one of the fears about designing the right KPIs. We want to find the perfect KPI, or create a list that tries to include everything. What we need are a few KEY indicators to trigger the right conversations about what actions (business levers to pull) to take or not take. We also need to discuss performance and action in a holistic manner and not get caught in panic mode because one indicator seems to be below expectation. We also do not want to trigger an action to artificially improve a number. For example…Days Sales Outstanding (DSO) can be used as a measure of customer satisfaction. The interpretation is that people pay the bills of the people they like first. If you are able to shrink the number, then you at least have an indication that customers are generally happier than they were last month. If the Marketing VP were compensated on Customer Satisfaction and we used DSO, the VP might change the payment terms. While we might see improvement in DSO, we are probably not seeing an improvement in Customer Satisfaction, which was the goal when we started. As leaders and managers we are trained to think of employees in terms of financial value. We give financial rewards based ideally on merit and performance. Unfortunately, we don’t use often enough other types of rewards for motivation and morale. I have two young children who do not yet demonstrate much grasp of financial matters. We offered them an allowance in an attempt to motivate routine and good behavior. While we understand the value, neither kid asked for their allowance in the last year since it was initiated. Clearly, it is not a motivational tool for our children right now. Both kids, however, love hockey. My youngest often lets me know she does not have as many hockey cards as her “brudder” and her brother often defaults to creating quiet games with those same cards. It seems only natural to use the cards as a motivational device. We will have to see how it plays out, but a couple of days in I can already see a marked difference. What are the financial tradeoffs – the hockey card budget is about 50% of what I would spend on allowance. When was the last time you created a “pat on the back” program? Could you do something different to motivate project completion? When was the last time you walked around the organization with $100 bills and randomly rewarded people doing the right thing? How often do parents buy snowblowers right after their kids leave the nest? Good employees often understand the tools they need to best do their jobs. Good analytical minds usually look for different ways to extract new information out of large data sets. This requires access to new tools, frameworks, and methodologies. If we are not reinvesting in improving our analyical capabilities, we risk losing our best people as they quest other ways to challenge themselves. We are then required to invest in the tools we declined to compensate for a loss of analytical brain power. Instead of purchasing tools after a star analyst leaves, we need to find fresh ways to challenge analytical minds. We can do a much better job of pointing people in new directions, or finding new ways to derive value. Otherwise, we’re left investing in expensive equipment to do necessary tasks. In the day and age of increased competition and homogenus services, what are you doing to maintain your customer base? In the past, the camera guys were able to get you to lock into their brand by giving you the body of the camera while charging higher fees for the different lens. Because the switching costs were so high, they essentially we able to maintain their customers. Look at frequent flier mile programs. They are basically taking a similar service and creating customer lock in to make sure that customers maintain their status. If the airline industry can do it with all their issues (lost luggage, long lines, delays and cancellations), why can’t you do it? Do you have a marketing program aimed at creating this type of loyality or lock in? How does your program compare to your competition? Could you do something differently? Do you offer something that is bought in quantity by your customers? If so, how can you leverage it more? What is the cost of acquiring a new customer? Often we think about creating new features to bring in new customers, while we try to force our existing clients to repurchase. Is a failed action the same as a failure to act? Over the weekend, Seth Godin blogged about making timely decisions. It brought to mind a number of items worth additional discussion. One of my favorite sayings is “we should do something” when managers are shown a potential issue. It is usually followed up with a flurry of meetings, too much information, and less than a clear path forward. While frustrating, it became clear over time that we often lack a process to consider, debate, and ultimately put ad-hoc course corrrections into action. It was also appearant that we suffer from a culture that uses information overload to decline action based on the need for additional information. 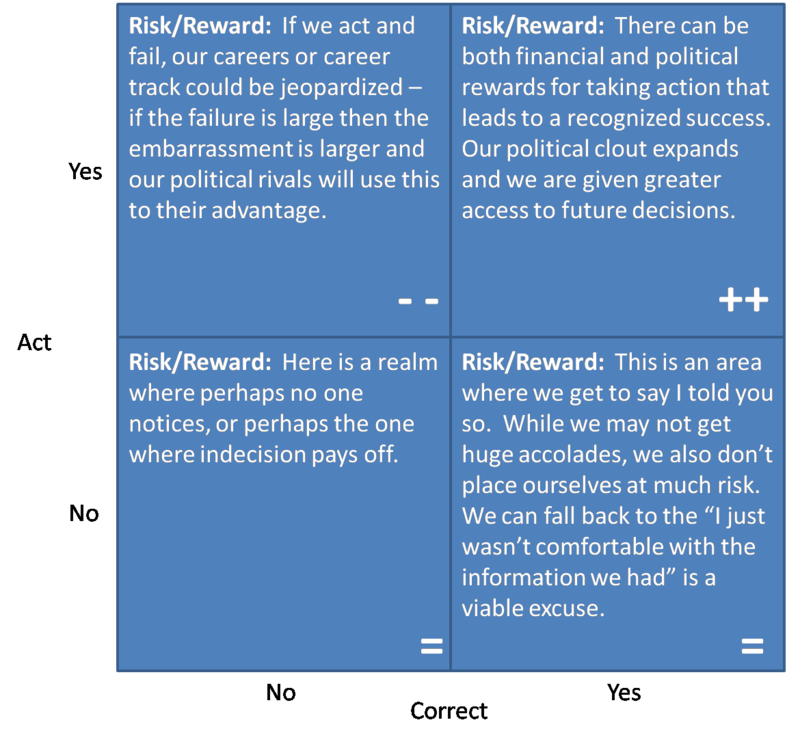 To make a little more sense of it, here is a two by two grid that shows the risk and rewards of whether action was created and whether it was correct or not. The goal of this was to highlight perhaps the personal motivations behind action or lack thereof. Creating action is more likely to cause the extremes in risk versus reward, while delaying or taking no action is often the safer route. While companies need to take risks to lead within the market, employees may not have the same motivations. Is the potential for a promotion, worth the risk of falling out of favor? Do we, as company policy, reward action financially? Is a failed action the same as a failure to act? When evaluating improvements in operational performance management, many focus on insuring that the metrics, KPIs and measures are aligned with the corporate strategy. We want to exel in customer intimacy so one of our KPIs will be CSat scores. This is a valid starting point but what happens once the ‘right’ metrics are established? KPIs are indicators, goals, targets. How then does the orgainzation align itself to those metrics and move them in the right direction? A simple framework for consideration is the E-C-R model: Expectations, Capabilities & Rewards. Alignment needs to extend across all these components of the operating model. KPIs are expetations; this is what we state is important to the business and will measure our alignment with our strategy. In order to move those KPIs in the desired direction, the organizational capabilities need to be aligned to those goals. Everything from human capital skills, technology, plant & equipment, business processes need to be evaluated and, most likely, retooled. We can’t implement CSat as our KPI and rely on the same call handling processes that leave customers’ issues unresolved but optimize AHT. Finally, the most critical and most challenging component is the reward systems. From cash compensation to promotions, career pathing, and public recognition, the “R” will ultimately be the driver of change. If the company is in a mature market, with a KPIs of market share and customer profitability, then why is the sales comp plan still focused exclusively on new logo acquisition and bookings? Don’t underestimate the change management required to implement an effective operational performance management system, aligning metrics to strategy.